Architecture: What is a Green Roof? Philadelphia continues to receive national recognition for its progressive green initiatives. We’ve been ranked one of the 10 greenest cities in the nation and are making strides towards the top of that list. One notable facet of this citywide greening process is the growing number of green roofs sprouting up on both public and private buildings. But what is a green roof? Sometimes referred to as “living roofs,” they are conventional roofs that have been covered by a layer of vegetation. These verdant blankets are beneficial to homeowners, businesses and the urban environment. They last longer than conventional roofs and help reduce energy costs by acting as natural insulation. Green roofs also reduce stormwater runoff, help lower urban air temperature and increase wildlife habitation. There are two types of green roofs: intensive and extensive. The intensive variety can resemble elevated parks, with shrubs, trees, even walkways and benches. They require a lot of maintenance, including drainage and irrigation. Extensive green roofs usually don’t function as public gardens and exist for environmental benefits only. They can be established on a very thin layer of soil, compared to the intensive roofs, which require more depth. Prominent Philadelphia companies and organizations have begun to discover the value of this eco-friendly architecture. Last September, the Free Library’s Parkway Central location unveiled its new green roof—the first green roof on a city-owned building. It encompasses 5,000 square feet on the south side of the building facing Logan Square, including 100 cubic feet of soil and more than 5,400 plants. Several months later, PECO opened its green roof on top of the company’s headquarters at 23rd and Market. It was the largest green roof ever installed on an existing building in an urban area in Philadelphia, totaling more than 45,000 square feet. 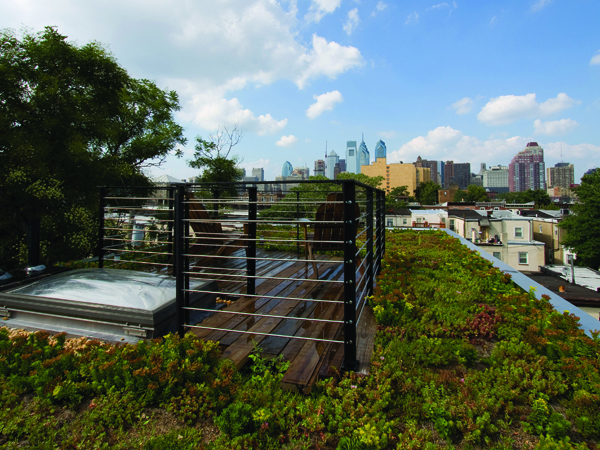 Philadelphia passed a green roof tax credit program in 2007, which provides incentives for installing vegetated roofs. Though currently applied to the Business Privilege Tax, which limits qualifying applicants, it’s a step in the right direction towards making the installation of green roofs a more accessible project.